Video clip synopsis – This is a film about Eddie Mabo - the man whose name lives on in a High Court ruling that has forever altered Australian life. Broadband MP4 mabo_bb.mp4 (10.6MB), suitable for iPods and computer downloads. 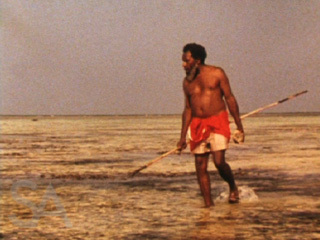 This video clip is an excerpt from the 86 minute film Mabo – Life of an Island Man, produced in 1997. This is a film about Eddie Mabo – the man whose name lives on in a High Court ruling that has forever altered Australian life. In 1788, the British claimed ownership of the entire Australian continent. To the European mind, the indigenous people who had occupied Australia for many thousands of years were nomads, without property, social organisation or systems of law. As a result, the British held that Australia was ‘Terra Nullius’, a land belonging to no one. This included the islands of the Torres Strait. In 1981, Eddie ‘Koiki’ Mabo and the other Torres Strait Islanders decided to fight for their ancestral right to the land on Mer, which the British had renamed Murray Island. They took the Australian Government to court. The case became known as the Mabo case. They argued for acknowledgment of ‘Native Title’ and the complex, customary patterns of land ownership, inheritance and use that predated colonisation. Central to the case was Malo, a Meriam god (represented as an octopus) who gave the Islanders their laws. In 1992, the High Court of Australia put an end to the legal fiction that Australia was empty before it was occupied by Europeans. When the court ruled in favour of the Murray Islanders, it recognised their equality before the law and the obligation for Australian law to respect Meriam law. In doing so, it marked a new way for Australia to view its history and future. ‘Mabo is the name that’s identified with a legal revolution in Australia. But Mabo was not just a court case: Eddie Mabo was a man – an obstinate, difficult and passionate human being, who was consumed with preserving the culture of a tiny island.’ Trevor Graham, co-author/director of Mabo – The Native Title Revolution. Who narrates the film clip? What information does the narration give the viewer? What stills (photographs) are included? Describe the opening shot of Eddie Mabo. Who is interviewed in the film clip? How does the viewer know their names? What do you think the filmmaker feels for Eddie Mabo and his family? What does ‘Native Title’ mean? What does ‘terra nullius’ mean? When did Eddie Mabo and other Murray Islanders lodge their claim in the High Court of Australia? When did Eddie Mabo die? What ruling did the High Court deliver on June 3, 1992? Discuss the findings of your research in class and construct a bullet-point document or Power Point presentation, ‘Mabo – Need to know’, using your research. Mabo – Life of an Island Man is a ‘social issue’ documentary, that is, a documentary that focuses on issues important to the community, whether it be local or international, in order to raise awareness. What issue does Mabo – Life of an Island Man explore? What are the various opinions about this issue? Give reasons why people from different backgrounds may have different opinions. Go to the DIY DOCO website for teachers notes on The Last Great Amateurs.